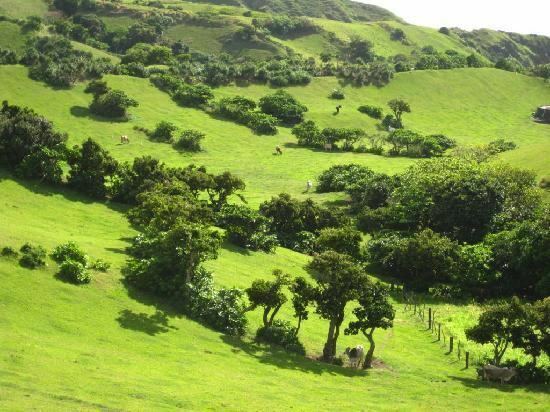 The Province of Batanes (Ivatan: Probinsya nu Batanes and Filipino: ) is an island province in the region of Cagayan Valley, Philippines. It is the northernmost province of the Philippines and is also the smallest province, both in terms of population and land area. The provincial capital is Basco on Batan Island. The ancestors of todays Ivatans are descended from Austronesians who migrated to the islands 4000 years ago during the Neolithic period. They lived in fortified mountain areas called idjangs and drank sugar-cane wine, or palek. They also used gold as currency and produced a thriving agriculture-based industry. They were also seafarers and boat-builders. In 1687, a crew of English freebooters headed by William Dampier came with a Dutch crew and named the islands in honour of their countrys nobility. Itbayat was named "Orange Isle" after William of Orange, and Batan was named "Grafton Isle" after Henry FitzRoy, 1st Duke of Grafton. Sabtang Isle was named "Monmouth Isle" after James Scott, 1st Duke of Monmouth. Capt. Dampier stayed for less than three months, and did not claim the islands for the British crown. In 1783, the Spanish claimed Batanes as part of the Philippines under the auspices of Governor-General José Basco y Vargas. The Bashi Channel had come to be increasingly used by English East India Company ships and the Spanish authorities brought the islands under their direct administration to prevent them falling under British control. However, the Ivatan remained on their idjangs, or mountain fortresses. In 1790, Governor Guerrero ( The Governor-general of the Philippines at this point in time is Félix Berenguer de Marquina, unless Guerrero refers to a governor of the Batanes.) decreed that Ivatans were to leave their idjang and to live in the lowlands, thereby giving them more people to tax. Basco and Ivana were the first towns. Mahatao was then administered by Basco, while Uyugan and Sabtang, by Ivana. Itbayat was not organized until the 1850s, its coast being a ridge. Ivatans were then ordered to dress like the other Filipinos, and it didnt take them long to adapt. Soon, Ilocanos were being put in the islands, so as to control the native population there. Limestone technology used by the Spanish were also being spread to the islands, so that their bridges became strong and fortified. Some of these bridges still remain at both Ivana and Mahatao. By 1890, many Ivatans were in Manila, and became ilustrados, who then brought home with them the revolutionary ideas of the Katipunan. These Ivatans, who were then discontented with Spanish rule, killed the ruling General Fortea and declared the end of Spanish rule. Toward the end of the Spanish regime, Batanes was made a part of Cagayan. In 1909, however, the American authorities organized it into an independent province. Because of its strategic location, the islands was one of the first points occupied by the invading Japanese imperial forces at the outbreak of the Pacific War. During the American colonial period, public schools suddenly boomed, and more Ivatan became more aware of their place in the Philippines. One of the first School Superintendents was Victor de Padua, an Ilocano, who in 1942-45 during the Japanese occupation was made Provincial Governor. In 1920, the first wireless telegraph was installed, followed by an airfield in 1930. Roads were constructed and the Batanes High School was instituted. In the morning of December 8, 1941, the Batan Task Force from Taiwan landed on the Batan Islands, the first American territory occupied by the Japanese. Japanese fighters from these islands took part in the raid on Clark Air Base later that same day. During the Second World War, the Japanese army committed atrocities against the Ivatan. When the United States regained the country, Batanes regained its provincehood. Beginning in 1945 liberated by the Philippine Commonwealth forces of the 1st and 12th Infantry Division of the Philippine Commonwealth Army was landing at Batanes were attacked by Japanese forces in the island during the Battle of Batanes. On July 23, 2007, a magnitude-5.2 quake rocked Batanes, but no damage or casualty was immediately reported. The United States Geological Service (USGS)(www.usgs.gov), said the quake was recorded at about 10:58 a.m., with the epicenter at 40 km south of Basco town in Batanes, about 250 km northeast of Laoag, Ilocos Norte; or 560 km south of Taipei, Taiwan. On June 1, 2008, a magnitude 6.3 earthquake struck the seabed off the coast of Batanes, but neither injuries nor damage was reported. The province comprises ten islands that are located in the Luzon Strait between the Babuyan Islands (belonging to Cagayan Province) and Taiwan. The islands are sparsely populated and subject to frequent typhoons. The three largest islands, Batan, Itbayat, and Sabtang, are the only inhabited islands. The northernmost island of the province, also the northernmost island in the Philippines, is Mavudis Island, also known as Yami Island. Other islands in the chain are Misanga, Siayan, Ivuhos, and Dequey. The islands are part of the Luzon Volcanic Arc. SABTANG ISLAND is undisturbed and unspoiled. The island has lots of natural attractions guaranteed to satisfy the most sophisticated nature lovers. It has intermittent white sand beaches with steep mountains and deep canyons with small level areas sporadically found along the coastline. Southwest of Batan Island, Sabtang is accessible by 30-minute falowa ride from Radiwan Port in Ivana. Sabtang Island is also the take off point for Ivuhos Island from Barangay Nakanmuan. ITBAYAT ISLAND is located north of Batan Island. Itbayat is shaped like a giant bowl. The island is surrounded by massive boulders and cliffs rising from 20–70 feet above sea level and has no shoreline. It has a dirt airstrip for light aircraft. A regular ferry runs the Batan-Itbayat route. Travel time is about four hours on falowa from Basco Seaport or Radiwan Port in Ivana. A light plane flies from Basco Airport to Itbayat at P1,875 per person and leaves only when the plane is full. BATAN ISLAND is the most populated island of the province. It is composed of four municipalities namely Basco, Ivana, Uyugan and Mahatao. Basco is the center of commerce and seat of the provincial government. MOUNT IRAYA is a dormant volcano standing at 1,517 meters whose last eruption was recorded in 505 AD. Mountaineering, trekking and trailblazing are recommended sports activities on the mountain. Walking distance from Basco, the top of Mt. Iraya can be reached in about three hours. 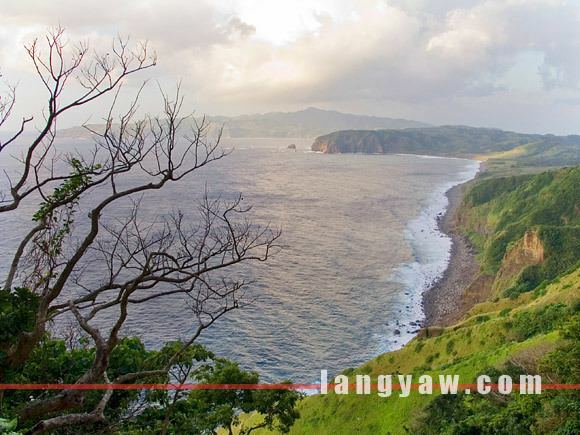 YAMI/AMIANAN is the northernmost island of Batanes. It is also called the Orchid Island. One can see Formosa (Taiwan) on a clear day. Tatus or coconut crabs abound in the island surrounded by rich marine life. DI-ATAY BEACH is a beautiful cove with multi-colored rocks and white sand ideal for picnics and beach combing. Located along the highway of Mahatao, it is 9.85 kilometers from Basco. SONGSONG in Chadpidan Bay is an hour of exhilarating trek from Basco proper (3 km). It is famous for its beautiful sunset view. CHAWA CAVE is for the more adventurous. An enchanted cave with natural salt bed whose mouth opens to the south China Sea and is accessible through the boulders of Chawa Point in Mahatao. It is four kilometers from Basco. SITIO DIURA AT RACUJ-A-IDE is the fishermens village at Mananoy Bay. Fishing season is marked by a festival in mid-March called Kapayvanuvanua. 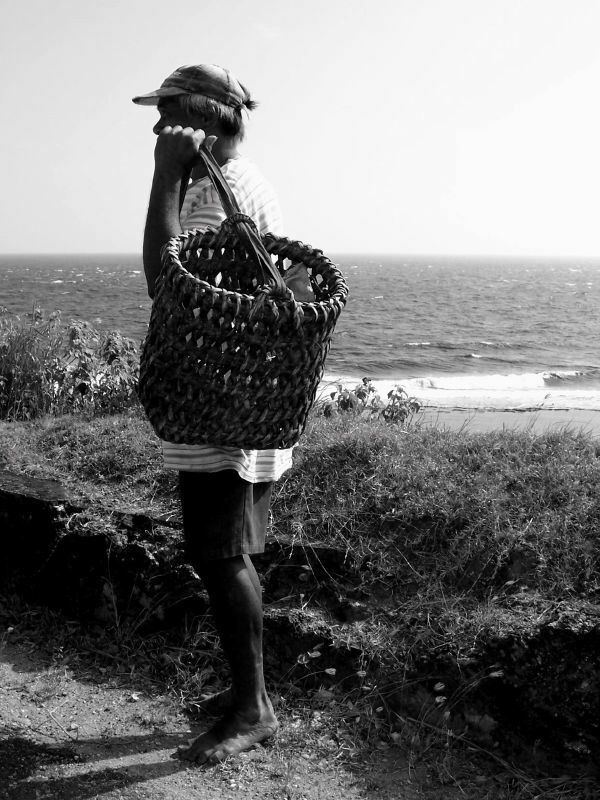 Visitors are treated with fresh fish delicacies from the Pacific Ocean. Within the area is the legendary Spring of Youth and living cave with crystal limestone formations. The bay is nine kilometers from Basco proper. NAKABUANG CAVE is 5.5 kilometers from San Vicente Centro in Sabtang. MT. MATAREM is an extinct volcano 495 meters at its summit. It is eight kilometers from Basco. WHITE BEACH at Vatang, Hapnit and Mavatuy Point all in Mahatao. RADAR TUKON was a United States weather station on a hilltop. It offers a magnificent 360-degree view of Batan Island, the South China Sea, Mt. Iraya, Basco proper, boulder lined cliffs and the Pacific Ocean. At present, it houses the last weather station in the north, the Basco Radar Station and is only 2.75 kilometers from Basco. OLD LORAN STATION used to house a US coastguard detachment for almost two decades and is about 25 kilometers from Basco. RUINS OF SONGSONG is a ghost barangay which is a cluster of roofless shells of old stone houses abandoned after a tidal wave that hit the island of Batan in the 50s. It has a long stretch of beach. The ruins are 23 kilometers from Basco. SAN JOSE CHURCH in Ivana was built in 1814. It has a crenellated fortress-like campanile. The church is fronting the Ivana Seaport and is 14 kilometers from Basco. SAN CARLOS BORROMEO CHURCH and a convent at Mahatao are six kilometers from Basco. It was completed in 1789 and still retains its centuries-old features. BUILDINGS are traditionally two-storey LIME AND STONE HOUSES AND CHURCHES with meter thick cogon roofs believed to last 60 years. These houses were built around 1795 with the help of imported masons, stone cutters and carpenters from the Province of Cagayan. These stone houses, found all over Batanes, are worthy subjects for photography. 5. Bird watching of cuyab, the migratory birds from China that flock the islands. They stop over in Batanes for a day or two before they continue their flight in search for warmer climate. Sometimes they are called Virgin Marys birds as they appear only on October during Our Ladys birthday. 6. The Kapayvanuvanua ritual in Diura at the start of the fishing season. The entire province is a place far from the maddening crowd with no traffic and pollution problems. There is practically zero crime rate except for simple drunkenness and other relocated incidents.